It’s critically important that we as a society reuse and recycle fabrics. The amount of fabric material going into landfills every year is staggering. These rice bag backpacks are a step in the right direction. 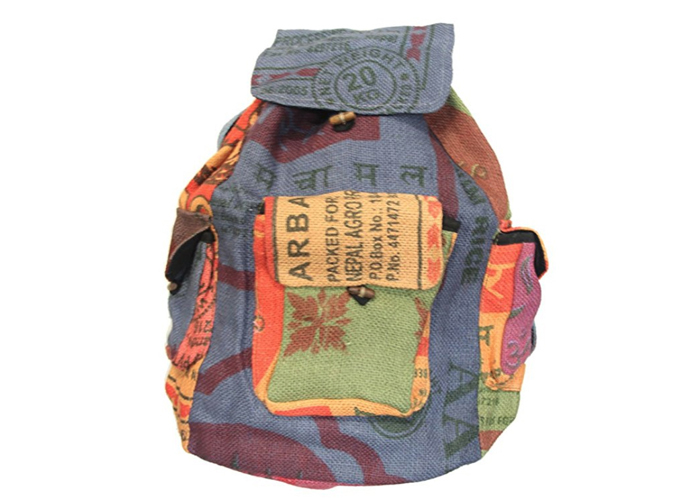 These backpacks are made from recycled jute rice bags. They’re made in Nepal. It’s a way to help people create a sustainable lifestyle and also provides a lovely, functional part of your own wardrobe. Note that the backpack is made from a recycled rice bag – I wouldn’t put heavy textbooks into this. It’s more for light items. The Om symbol represents the sacred sound of the soul within us all. 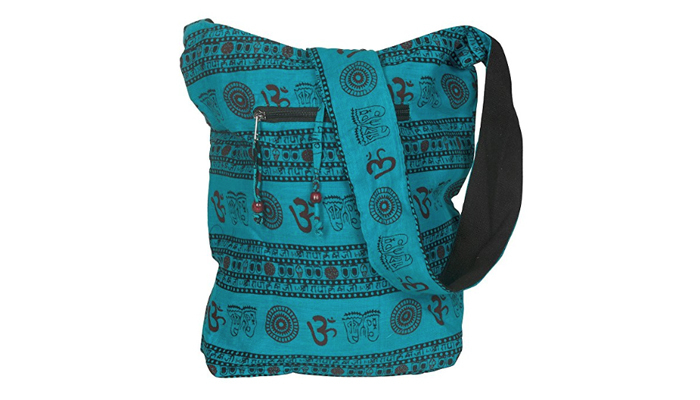 This beautiful blue shoulder bag is decorated with that om symbol and is a fair trade product as well. The design repeats all around the bag with the om, a wheel, and other similar shapes. The strap is long and sturdy. There’s a zippered pocket as well to hold a wallet or cellphone. The purse itself is 13 inches wide by 15 inches tall. The strap is 18 inches of drop. A great way to carry your belongings – it’s both delightfully stylish and also a reminder to be mindful about all we do each day.